Time change is with us again. Remember to set your clocks back an hour. Hopefully, no one is running old systems which will fail to adjust the time automatically.If you are one of those unlucky to be running an old system, one of things you can do is turn off the Time Change Settings. 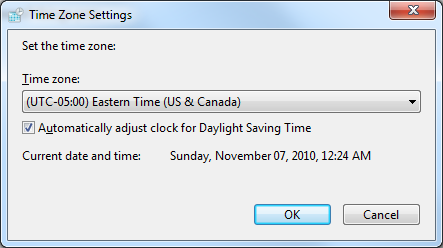 For example, in Windows 7 its found in the Time Zone settings. Here is a screen shot of it. 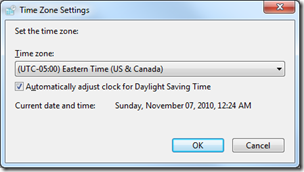 Uncheck the box for automatically adjust clock for Daylight Savings Time. 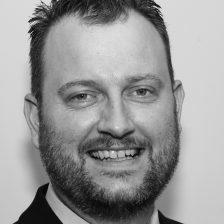 Next create a script that invokes the Time command running with admin privileges. For example in Eastern time, you would create a script set it to run Nov 7 @ 2:00am which would contain the command line Time 01:00 and a command to not invoke the script again. (If you didn’t do step 2, you risk creating a loop that re-run every hour) Another option would be to invoke a PowerShell script using the Set-Time command. When the time sprung ahead in the spring, simply use the same command but instead of setting the time to 1:00am, set the the time to 3:00am. This was something we would do on a VAX 3000 server I had running in one of the hospitals I was responsible for in Northern Ontario.